Some people have natural artistic ability, while others, despite their creative leanings, do not. I am a member of the latter group: I can barely trace my own hand, yet the idea of being able to paint or draw is nonetheless incredibly enticing. Corel’s Painter Essentials 3 makes it simple for the artistically challenged to create beautiful digital drawings and paintings from their photographs. Yet, the program is also powerful enough to gratify experienced artists who may be making their first foray into digital art. 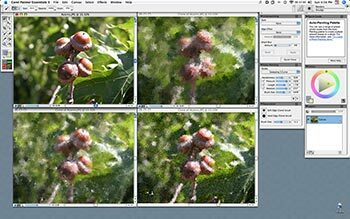 Painter Essentials, built on the foundation of Corel’s pro-level painting application, Painter IX ( , February 2005 ), lets you alter your digital photographs to make them look as if you painted them by hand. To accomplish this, the program creates a copy or “clone” of your original image, puts it on a hidden layer within a new document, and places another transparent layer on top of that to act as digital tracing paper. The cloning process also creates a palette of colors taken directly from your photograph, which you can use as “paint” for creating a new image. Once the cloning process is complete, you can select a medium, such as paint, pastel, or pencil, and then choose the brush and stroke style that you want to use for your picture. From there, you use Painter Essentials’ Auto-Painting palette to automatically create your new image. There are many variables that you can select and change, including how randomly the program applies each new stroke to the canvas; as a result, no two renderings of a single image ever has to look exactly the same. Painter Essentials 3’s drawing and painting tools let you apply a variety of diverse artistic styles to your images. I found this process to be amazingly rewarding. After about 10 minutes, I was playing with the program’s many brush and style variables as well as experimenting with brush strokes. Essentially the program’s automated process became an expression of my artistic desires, yet I didn’t have to deal with any of the insecurity associated with doing the same thing by hand. Painter Essentials 3 also works well as a digital sketchpad. While the Auto-Painting palette is great for beginners, the program’s freehand drawing tools allow artists of all levels to create new images from scratch. You can draw with your mouse, but Painter Essentials 3 works best with a drawing tablet because it simulates the feeling of freehand drawing and painting. One negative is the limited number of undos: Painter Essentials allows you to undo only the last five keystrokes. Any program geared to novice users should have more undos than that to allow for increased experimentation. And more undos probably wouldn’t be a bad idea even for more-advanced artists. I also found the program’s cropping implementation a bit odd. Most consumer photo-editing programs, such as Apple’s iPhoto ( ; April 2005 ) and Adobe’s Photoshop Elements ( ; February 2005 ), require you to select the area that you want to crop and then choose a Crop command from a menu. But in Painter Essentials, you use the Crop tool to make your selection and then click once within that area. This worked well once I got used to it. Painter Essentials 3.0 is an extremely powerful program that gives beginning artists the ability to create beautiful artwork, as well as the freedom to experiment in ways they may never have dreamed possible. The program is also powerful enough for more-experienced artists to explore an image’s potential.